The pitch: Two men get trapped in a mine shaft. Nothing happens. Then they get rescued. The end. The suits harrumph: where’s the drama? The screenwriter and her agent scramble: well, we flash back to generic good times with families and watch the trapped guys banally discuss heroism and loyalty and STARSKY AND HUTCH. Imagine you’re really really short. The suits aren’t buying it. The screenwriter and her agent squirm. Seen it a thousand times in movies and LASSIE episodes and probably on GILLIGAN’S ISLAND. Oliver Stone‘s WORLD TRADE CENTER is not about the World Trade Center. Nor does it posit stances or pose questions on conspiracies, religionism, racism, political ideologies, oil collusion or White House incompetence. Which raises the obvious question: why then make a movie about the World Trade Center at all? To invoke a known audience. “World Trade Center” has become synonymous with “9-11” (itself a contraction of a culture-shocking event) and both have become shorthand for identifying the modern version of the Common Enemy and proselytizing on courage and heroism and misplaced patriotism. Attaching that moniker to any media – however tangentially – sells tickets. Now imagine you’re seeing a big ice cream cone. The first act is restrained film-making at its best, as Stone shows us Tuesday, September 11, 2001, dawning like any other mundane workday, New York populace going through the motions of city life. Comparisons with the unobtrusive camera of Paul Greengrass’s superior UNITED 93 are unavoidable, and – like that movie – a vicarious thrill builds in our bones, for we know something that the New Yorkers don’t: that today is going to be so far removed from mundane it will gouge out its own vernacular in history. 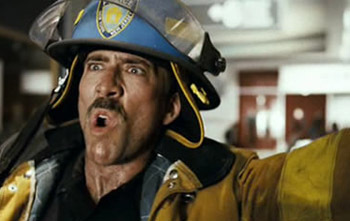 Stone does not explicitly show airplanes impacting Towers (it would remove focus from his characters), but his scenes of destruction and mayhem are as good as cinema gets. And though there are still whiners puling “too soon,” the audience yet extracts a rubbernecker’s glee from watching this unimaginable tragedy unfold with astoundingly seamless special effects from a Ground Zero ringside seat. Stone has also captured excellent performances with the shock, surprise, horror and incredulity of the officers arriving at Ground Zero. 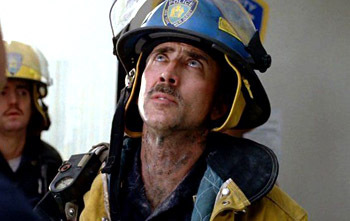 Those of us who were not there could never hope to imagine what uncontainable emotions overwhelmed each First Responder’s breast as he gazed up at a tableau which the wildest imagination could never conjure. And after injecting us into the heart of the action, with a breath-stopping sequence trapping our stars under mountains of rubble, the film – like the World Trade Center – collapses. For there is nowhere to go – literally and figuratively – and it becomes obvious that inexperienced screenwriter Andrea Berloff has formulaically set up a tearjerker just waiting to happen. The movie also loses what little objectivity it strived for when Jimeno launches into an extended “heroism” speech (which veritably bends over and spreads its cheeks for the hero mongers). 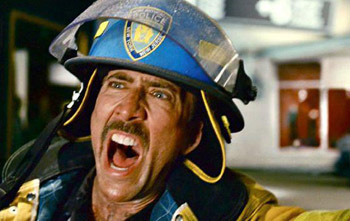 Meanwhile, Cage’s initial heartfelt performance of McLoughlin diminishes over time, as he uses up the film’s one allocated swear word (as decreed by the MPAA for PG-13 films) early in his desperation and then becomes non-believable, as no one in this mind-breaking situation ever swears after that one transgression, making it all as painfully PG-13 as any Freddie Prinze Junior debacle. Nothing continues to happen, proving conclusively that not every true story is worth telling. The rescue of the two men contains its fair share of nail-biting and was apparently instigated by an ex-Marine, Dave Karnes (Michael Shannon), who abandoned his job in Connecticut and traveled to Ground Zero because “God called him.” (While talking to Karnes, God must have neglected to head on over to Emma E. Booker Elementary School in Florida and talk to Bush about the attacks. Without a direct word from God, how could anyone be expected to abandon the compelling Pet Goat to lead a country? Evidently, only after the attacks does God deign to start talking with W.) As we learn of Karnes’s delusional nature (obsessing over Marine ethos to the point of asking to be addressed as “Staff Sergeant”), we realize this is the exact type of bulldog fundamentalist bred by the American Armed Forces, and that it wasn’t God calling him after all – it was his red neck. Staunch performances by the supporting cast (Stephen Dorff, Frank Whaley, Brad William Henke) add little to the pat formula. To its credit, the story does not make it seem like rescuing its two stars puts an end to the horror, and the unfinished nature of the rescues and aftermath are noted; Jimeno’s family walk past a wall posted with hundreds of Missing Person flyers, Karnes emerges from the rescue rubble talking of retribution, Dorff’s policeman laments the multitude not accounted for, and McLoughlin himself had to undergo 2 years of medically-induced comas and 27 surgeries – well, that’ll happen when a World Trade Center falls on you. Or maybe he just wanted to look like John Travolta again. Writers: Andrea Berloff, John McLoughlin, Donna McLoughlin, William Jimeno, Allison Jimeno. Starring: Nicolas Cage, Maria Bello, Connor Paolo, Michael Peña, Jude Ciccolella, Nicholas Turturro, Danny Nucci, Tom Wright, Maggie Gyllenhaal, Brad William Henke, Donna Murphy, Michael Shannon, Stephen Dorff, Frank Whaley, Peter McRobbie.